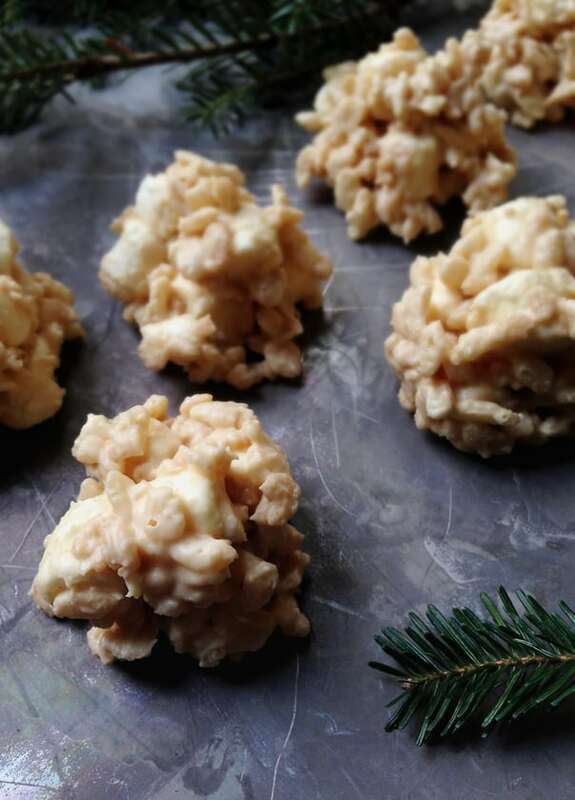 No-Bake Avalanche Cookies are a quick and easy holiday cookie you can make in a pinch. With just five ingredients, these Christmas cookies will be ready in a snap! Christmas cookies are ubiquitous, but the holidays always sneak up on me somehow. I’m always so busy, and you never do know when you’re going to be asked to bring dessert to a party. It’s always a good idea to have some great cookie recipes in your back pocket. Recipes that only need a few pantry staples and take just a few minutes to pull together are even better. Can you tell I’ve had to make a few last-minute batches of cookies in my life? 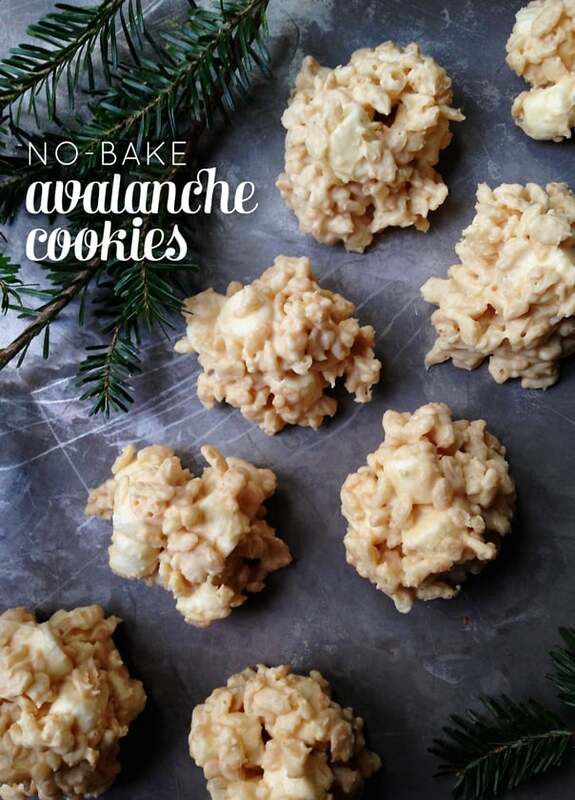 These No-Bake Avalanche Cookies require just five ingredients and not one second of baking. Win! 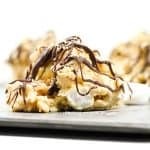 These No-Bake Avalanche Cookies are a melt-in-your-mouth cookie recipe that you can whip up in absolutely no time at all. You’ll need white chocolate chips, peanut butter, crispy rice cereal, baby marshmallows and a pinch of salt. I’m willing to bet you have at least two, maybe even three, of those things in your pantry right now! Seriously, that’s all you need to make these gooey yet crunchy treats. Well that, and about 20 minutes. 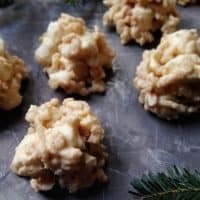 No-Bake Avalanche Cookies need time to set up, but you can pop your cookie sheet (affiliate link!) in the fridge for half an hour and they’ll be ready to go. They’d also be a great cookie recipe to make with kids, since the only heat source used is the microwave. 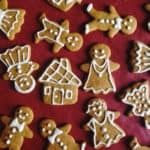 Enlist your little ones to help you stir and spoon the cookies out onto the parchment paper. Maybe let them sneak a few extra marshmallows or two. After all, it is the holidays! And before you ask, I’m not sure where Avalanche Cookies get their name. I assume because of their pale color and their semblance to snowballs? It doesn’t really matter though. They’re delicious and that is all you need to know. Oh, and they’re gluten-free. You should know that too. 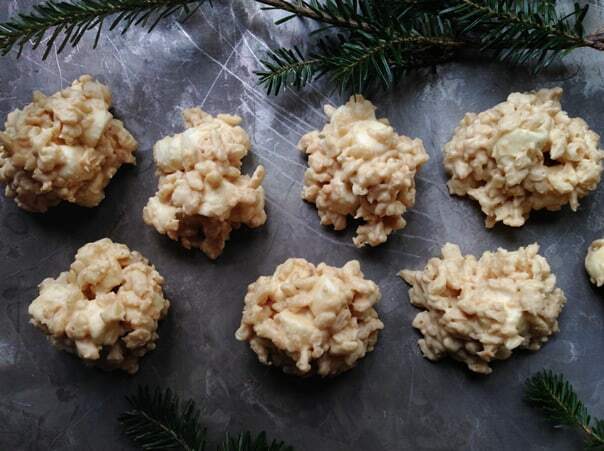 Do you love simple no-bake cookies and want to add some more to your Christmas cookie arsenal? You’re in luck. You might give these No-Bake Nutella Oatmeal Cookies or these No-Bake S’mores Cookies a try. They’re so, so good. And you can make them gluten-free, too! 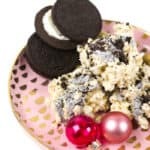 I’ve even made No-Bake Cookies and Cream Avalanche Cookies for a twist on this recipe. 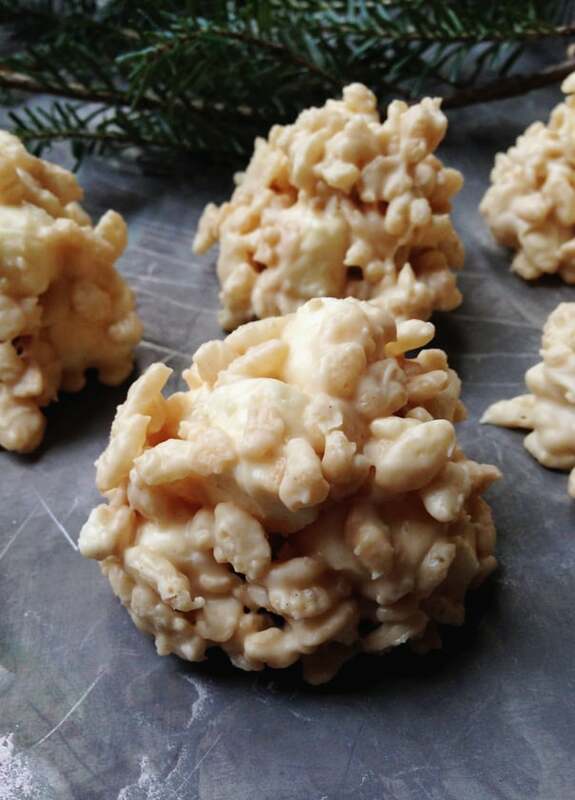 My friends are also big fans of a good no-bake Christmas cookie. Check out My Baking Addiction’s No-Bake Cookies, filled with oats and peanut butter. I also like No-Bake Peppermint Bark Cookies from The Speckled Palate and Maureen’s Rice Krispie Cookies from Stephie Cooks. And for a recipe that literally couldn’t be easier, check out Chocolate-Covered Oreos from Cake ‘n Knife! A quick, gluten-free cookie recipe for the holidays. Perfect for parties and cookie swaps! In a large bowl, stir together cereal, marshmallows, peanuts (if using) and salt. Set aside. In a glass, heat-safe bowl, melt the white chocolate chips in the microwave for 20 seconds on 50% heat. Stir. Repeat until white chocolate is completely melted and smooth. Be careful not to overheat. Stir in the peanut butter until well-combined. Pour white chocolate mixture over the cereal and marshmallows. Stir until the white chocolate completely coats the cereal mixture. If it's runny, add more cereal and marshmallows, 1/4 cup at a time. Thanks so much for sharing this for Christmas Cookie Week! It’s so fun to see so many bloggers coming together to share favorite recipes and new recipes for the holidays and hopefully connecting with one another to make some new friends! What a perfect recipe for this busy time of year! I love baking Christmas cookies, but sometimes it is so hard to find the time. These are the perfect solution. They look delicious! 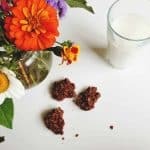 This is exactly what i need – no bake cookies! Definitely perfect for holiday party. I know that I will love, love, love this cookie recipe. This is my 1st year giving Christmas tins of goodies to family and friends so I’m a little nervous2 about what cookies I can make ahead and how to make sure they’re all fresh. Can these be stored for any length of time? 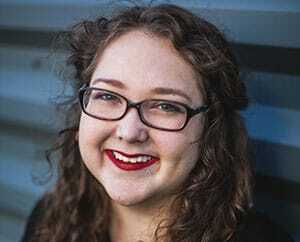 Any words of advice you can pass down to a beginner? I’d appreciate it more than you’ll know. Hope you and yours have a very Mery Christmas and a Happy New Year! Hey Sandie! So glad and honored to hear you are trying these for your first Christmas gift tins! They will definitely keep, but about a week or so in an airtight container. You can freeze them also if you want to get really ahead! Just put them in an airtight container that’s freezer-safe and they should keep up to 3 months for best quality. I hope this helps, and happy holidays to you too!